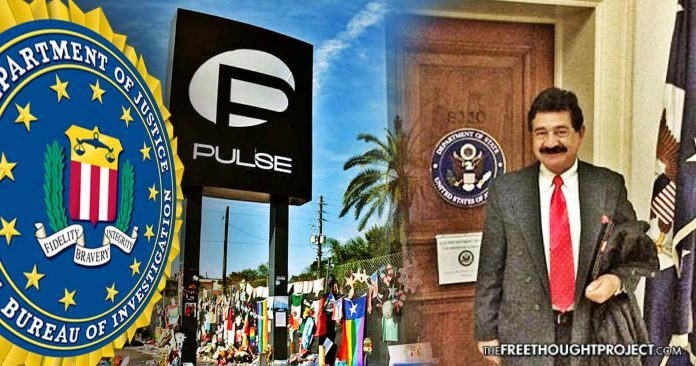 In a bombshell revelation, court documents revealed that the father of the Orlando shooter, Omar Mateen, worked for the FBI and got his son out of an indictment that would've prevented the shooting. Orlando, FL — Headlines across the internet today are focusing on the March for Our Lives movement that took place over the weekend in which hundreds of thousands of kids and adults begged the government to disarm them to ostensibly prevent mass shootings. As the government moves in to boost the police state, a quiet headline out of Florida revealed that the father of the Pulse gunman was actually part of that police state and may have known of his son’s plans to attack the nightclub. Attorneys for Noor Salman are calling for a mistrial after they say new details from prosecutors reveal that Pulse gunman Omar Mateen’s father was an FBI source and is currently under a criminal investigation, according to a scathing report from ClickOrlando.com. Seddique Mateen, Omar Mateen’s father, was an FBI informant for 11 years, according to a motion filed by the defense. From 2005 until June of 2016—when his son murdered 53 people in an Orlando nightclub—Seddique had an intimate relationship with the FBI. His position within the FBI appears to be the apparent impetus behind the controversial cover-ups and even the reason for Omar Mateen to have legally purchased the firearm he used in the massacre—in spite of setting off multiple red flags. The defense claims that to protect their asset, Seddique Mateen, they are attempting to pin charges on Omar’s wife. What’s more, according to the defense, Seddique’s role within the FBI also stopped an indictment against Omar in 2013—which could have put him in jail and prevented the massacre—because he was threatening his coworkers. “Mateen’s father played a significant role in the FBI’s decision not to seek an indictment from the Justice Department for false statements to the FBI or obstruction of justice against Omar Mateen during its 2013 investigation into his alleged threats,” the motion stated. According to the defense, Seddique is currently under investigation for money transfers to Turkey and Pakistan after documents were found at his home on the day of the Pulse attack. In spite of being under investigation for plotting international acts of terror, Seddique was campaigning for then-Democratic presidential candidate, Hillary Clinton. The FBI asset who was under investigation for plotting acts of war, who kept his son out of jail for threatening to kill people—which allowed a mass shooting to happen—appeared in photos with Clinton, positioned directly behind her during her speech. “What went into your decision about going to this event right near Orlando, where this Pulse nightclub shooting happened?” Mateen was asked at the event. He then replied with a bizare answer that had nothing to do with the question. But that is not all. 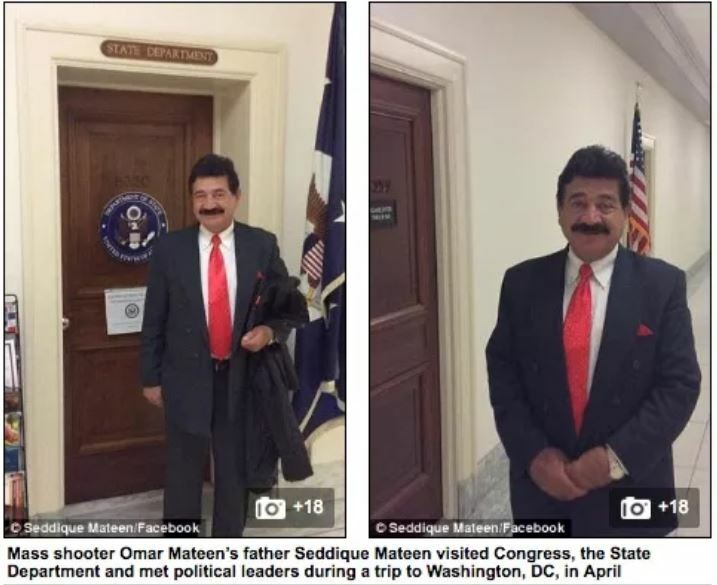 Seddique Mateen was also a regular visitor to the White House and there are photos from his own Facebook page to prove it. Only 2 months before his son—who he knew threatened to kill people—would carry out the deadly attack in Orlando, Seddique Mateen was shaking hands with political leaders in Washington DC. As TFTP reported at the time, the FBI was also tipped off by a gun store owner about Omar’s attempt to purchase body armor and a large amount of ammunition. Nothing happened. Since the beginning, the FBI has been covering up what really happened in Orlanda and it appears that we now know why. They are protecting their asset. As TFTP reported, this protection started at the beginning. A letter from the FBI dated June 20, 2016, attached to a lawsuit brought by the City of Orlando seeking the release of 911 calls in full, as well as other records pertaining to the shooting, had also been forwarded to the Seminole County Sheriff’s Office — but included instructions for law enforcement to deny all requests for information. It now seems that Noor Salman is going to take the fall for her abusive husband’s bloody rampage—despite being unethically coerced and likely innocent—and all of it is due to the FBI’s attempt to cover for the real accomplice, their own asset.